Now this is the season of Avocados. Our family loves Avocados. I make Avocado Chappathi, Avocado Smoothie, Avocado Egg Salad Sandwich etc. for us often. I was thinking I should make something with Avocado for Shreeya too. Apples and avocadoes go really well. Avocado has a creamy texture, so babies would generally like it. Shreeya loves it. It is also very simple and easy to make. You just have to grind apples and avocadoes together, and you are all set to feed your baby. It makes their little stomach full too. Try it our and your baby will like it. When Should You Introduce Avocado and Apple? Apple and Avocado are usually recommended for babies between 6 to 8 months old. Please discuss with your pediatrician just before giving it to your baby because generalities may not apply to your child. It is a good idea to introduce one food at a time waiting 4 days before another new food can be introduced just to make sure your baby is not allergic to it. If your baby has latex allergy, then you might want to avoid avocado and discuss it with your pediatrician. Ripe Avocado (peeled and pitted) 1/2 no. Peel the skin off the apple. If your blender can grind the apple’s skin smoothly, then you may add the apple’s skin if not discard it. Then cut the apple into small chunks. Scoop out the avocado flesh. In a blender, add apple chunks, avocado flesh, and water. Grind until smooth. The puree/mush should be of thin consistency. You can wrap up the Avocado and Apple Mush with a cling wrap and refrigerate the Avocado Apple Mush for 2 days. The color will change slightly still it will taste good. How To Make the Avocado Ripen Quickly? You can store the avocado in a paper bag. Place the avocadoes in a cool place for two days to ripen. Apples are one of the fruits that are highly contaminated with pesticides so purchasing organic is your choice. Apples should be firm without indentations, bruises and cuts. Choose brightly colored apples and avoid discolored ones. Avocados are one of the least contaminated with pesticides so purchasing organic is your choice. Buy firm avocadoes and when you press them gently, they should yield. Avocadoes should neither be very hard or squishy. Hard avocadoes are unripe and squishy avocadoes are past their prime. When you cut the avocado into half, the inner part should be green and the color surrounding its pit should be buttery yellow. 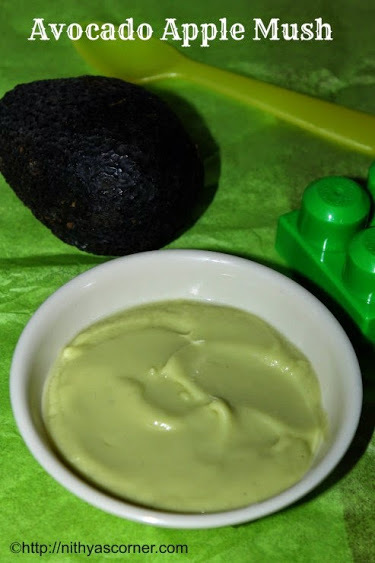 If you are planning to give Avocado Puree right away to your baby, buy ripen ones. If not buy little unripe ones and ripen it at home. How To Pit and Slice the Avocado? Cut the avocado into half working around the pit. Twist the two halves apart. The pit will come off. Using a spoon, just scoop the flesh out. How to Avoid Apple and Avocado From Browning? You could soak apples and avocado in cold water, apple juice or pineapple juice or lemon juice to prevent it from browning. The citrus acid might be allergic to babies so ask your pediatrician first. Do not refrigerate the avocadoes before they are ripe. They will not ripen well later. Though avocadoes do not look appealing when oxidized, yet they taste good. Just scrap the brown part and eat it. The peel and pit of avocado might be allergic to pets so be dispose them off carefully. Apple and Bananas goes well with each other. I love them in smoothie. Why not try the same for baby who is 6 months old? Shreeya likes this combination so much. I give it to her in the evening. I do not make this mush in a large quantity and refrigerate it because I fear it would get oxidized and also the color would change. I prefer Apple Banana Mush to be fresh for Shreeya. Babies usually like it because of its natural sweetness. 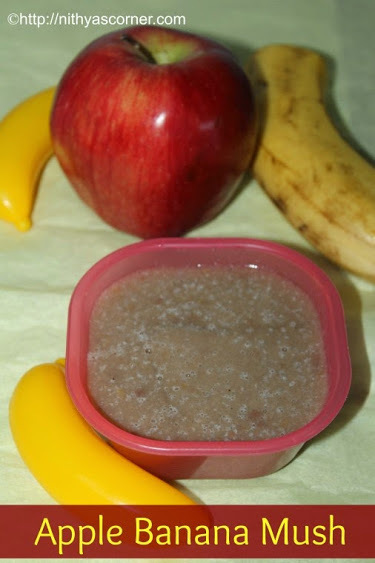 Apple Banana Mush provides lot of energy to our babies. Feed your baby and I am sure you are going to have fun! When Should You Introduce Apple and Banana? Apple and Bananas are usually recommended for babies between 6 to 8 months old. You should steam the apples until tender and then puree it. I would prefer to avoid giving raw apples to babies. Please discuss with your pediatrician just before giving it to your baby because generalities may not apply to your child. It is a good idea to introduce one food at a time waiting 4 days before another new food can be introduced just to make sure your baby is not allergic to it. 1. Cut the apple into small pieces and deseed it. In a pan, add 1/2 cup of water and boil the apple pieces. When apples turn tender, switch off the stove. At this stage, when you prick the apples with the fork, the apples should fall out. Also, the quantity of the water would have reduced by half. Reserve the water. Let the apples and the water cool down completely. How to make apple and banana puree for 6 months baby? 2. Peel the banana, and mash it nicely using a fork. Grind the steamed apples, reserved boiled water and mashed bananas to a fine puree. The consistency should neither be too thick nor too thin. Now Apple Banana Mush is ready! Serve it immediately. How To Select Apple and Bananas? Apples are one of the fruits that are highly contaminated with pesticides. Apples should be firm without indentations, bruises and cuts. Choose brightly colored apples and avoid discolored ones. Bananas are available throughout the year so you can buy it whenever you want. Buy smaller bananas so that the unused bananas do not get waste. Bananas must be firm and avoid buying the green ones. If you buying the green bananas, please wait for few days until they are ripe. If you feed green bananas to the baby, it would constipate and may upset their stomach. How to Avoid Apple and Banana From Browning? You could soak apples and bananas in cold water, apple juice or pineapple juice to prevent it from browning. The citrus acid might be allergic to babies so ask your pediatrician first. If bananas are unripe, put them in a plastic bag and they will ripen faster. I bought a packet of soybeans from a store wanting to try out few recipes at home. Though the pack looked small, there were a large quantity of soy beans. When I was discussing with my mom how to finish off the soybeans, she said she is going to give some of the soybeans to Shreeya. Though it is not advisable to give soybeans to babies very often, it is not wrong to feed them soybean once in a while. Some babies are allergic to soy so if you see certain symptoms like diarrhea, nausea, asthma, vomiting etc. then stop the soybeans immediately and consult the pediatrician to check if you baby is allergic to soy. If you want to omit soybeans, then make a puree with carrot, rice and peas instead of soybeans. 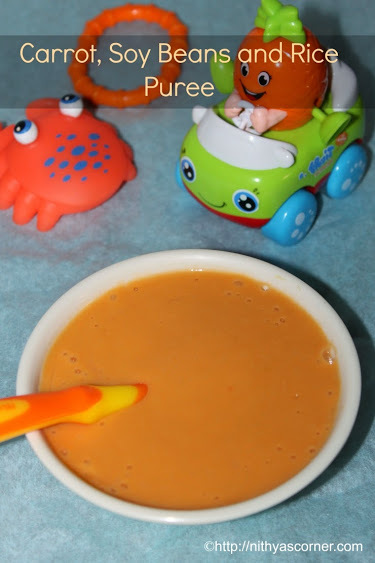 My daughter Shreeya liked the puree so much and hopefully your baby would like it too. When Should You Introduce Carrot, Rice and Soybeans? Carrots, Rice and Soybeans are usually recommended for babies between 6 to 8 months old. It is better to steam the carrots and then puree them.Carrots have high nitrates and that is the major concern for the parents. Please discuss with your pediatrician just before giving it to your baby because generalities may not apply to your child. It is a good idea to introduce one food at a time waiting 4 days before another new food can be introduced just to make sure your baby is not allergic to it. 1. Cut the carrots into small pieces. Soak the soybeans in water overnight or for 8 hours, and then boil it on stove top until they are cooked. Now boil 1/2 cup of water and add the uncooked rice. When the water comes to a rolling boil, add the boiled soybeans. 2. When the rice is almost cooked, add the carrots. Boil well until carrots are also cooked. 3. Now you would have very little water left once the rice and carrots are cooked. Once it cools down, transfer it to a blender and without adding water, puree it. Now Carrots, Soybean and Rice Puree is ready! How To Select Carrots ? Buy rich orange color carrots than the light colored onees. Rich orange color carrots have more beta-carotene . If the carrots have nice green tops attached, then the carrots are fresh. If the green tops are droopy, then avoid them. Also avoid carrots that are soft, discolored and have cracks in their skin. How To Store Carrots ? Store the carrots in the coolest part of the refrigerator. They will stay good for 2 weeks. Shreeya likes Peas and Rice Puree very much. I started giving her this puree recently when she turned 6 months old. I give it to her for lunch twice a week. Adding rice to the peas puree makes it quite heavy for her, and she sleeps well after having the Peas and Rice Puree. Moreover, Rice provides lot of energy. I think most of the babies like Peas and Rice Puree because of the sweetness from the peas. 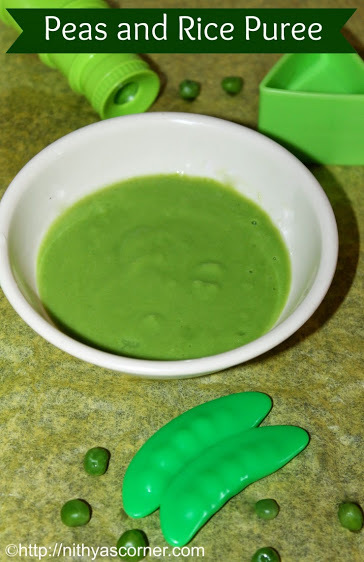 If you are using fresh peas, you may find it little difficult to puree the skin smoothly. I always use frozen peas so it makes my work much easier. You can try a lot of combinations with peas. Peas goes well with many veggies and fruits. are rich in minerals, vitamins and anti-oxidants. are a good source of proteins, and soluble as well as insoluble fiber. are an excellent source of folic acid. helps body develop resistance against infectious agents. helps lower cholesterol levels in the body. helps in bone mass building function. When Should You Introduce Peas? Peas are usually recommended for babies between 6 to 8 months old. Please discuss with your pediatrician just before giving it to your baby because generalities may not apply to your child. It is a good idea to introduce one food at a time waiting 4 days before another new food can be introduced just to make sure your baby is not allergic to it. 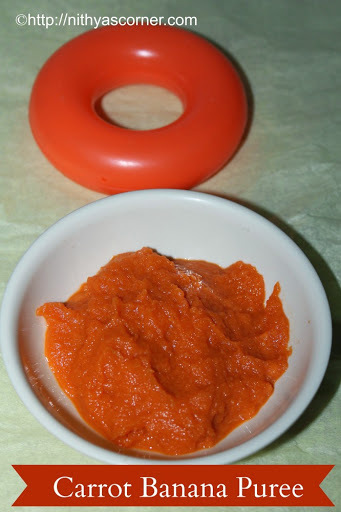 Carrot Banana Puree is one of the easiest baby food to make. You just have to grind both the carrot and banana smoothly and you are all done. Babies would generally like this puree because of its sweetness. Shreeya likes it so much. I try combining carrot with some other veggie or fruit but Shreeya likes this combination very much. When I am super busy and do not want to take chances, I make this puree and give it to Shreeya. I would be 100% sure that Shreeya will definitely like it. When Should You Introduce Carrot and Banana? Carrots and Bananas are usually recommended for babies between 6 to 8 months old. It is better to steam the carrots and then puree them.Carrots have high nitrates and that is the major concern for the parents. Please discuss with your pediatrician just before giving it to your baby because generalities may not apply to your child. It is a good idea to introduce one food at a time waiting 4 days before another new food can be introduced just to make sure your baby is not allergic to it. 1. Boil carrots using 1/2 cup of water until soft. Then let it cool down. 2. Peel the banana and cut them into round slices. Then grind the steamed carrots and banana until smooth using 2 tablespoon of water. Make sure the carrots are well grinded. Now Carrot and Banana Puree is ready! How To Select Carrots and Bananas? How To Store Carrots and Bananas? Store the carrots in the coolest part of the refrigerator. They will stay good for 2 weeks. If bananas are unripe, put them in a plastic bag and they will ripen faster. To prevent banana from browning, I just soak bananas in cold water to prevent it from browning.